"Why don't you kick yourself out? You're an immigrant too?" What Did You Think Was Going To Happen (this album) (2010). 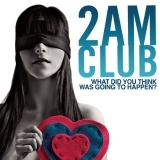 Sorry, no matches on eBay for "Make You Mine 2AM Club".